Any book on traditional seasonal events and ceremonies in Japan will include in its section on November ( or the 10th month according to the old calender) a bit on a special day called the Ebisu-Ko, which in past ages was celebrated in various ways depending on what part of Japan you are in- by either farmers or merchants. In fact, it seems as if during the Edo Period, and then for many decades after, this was one of the most anticipated occassions of the year- especially in thriving merchant quarters. I have found an old Japanese children`s song (warabe-uta) which will attest to that fact. This little ditty first lists one major festival or event for each month of the year: New Years, Hatsu-Uma, The Doll Festival (Hina Matsuri), Buddha`s Birthday, The Boy`s Festival, The Tenno Festival, Tanabata, Hassaku, The Chrysanthemum Festival- which are all mentioned plainly, representing each month from January. Then, when it comes to November,the 10th month according to the old calendar, the song goes: but if you are invited to an Ebisu-Ko party….. and then proceeds to describe a fantastic feast which could be had for the occassion ( I will write out the text of this song below). Despite the popularity this event apparently once had, in all the year`s I have been in Tsukuba, I had never heard a thing about it ( besides reading about it in books), and eventually assumed that in this part of Japan, the custom had completely disappeared. Then I moved into Hojo, an old town ( now part of Tsukuba City) with a once thriving commercial district. It was right smack in the middle of its main shopping street that I saw, for the first time since coming to live in Ibaraki Prefecture, evidence that the Ebisu-Ko still existed- a sign informing passsers- by that this year, the day for making offerings to Ebisu would fall on November 19th. This greatly aroused my curiosity. And though I have found out that these notices were merely the attempts of a soba noodle factory to promote sales by reminding local residents of this once great event- and that VERY FEW ( if any) people really do celebrate the Ebisu-Ko in Tsukuba any more, my research into the history of the custom proved extremely interesting and rewarding. Anyone with a deep interest in Japanese culture should feel the same way about what I found out. Let me share a bit with you. Ebisu, written variously the with characters: 恵比寿,恵比須 or 夷, is a divinity of GOOD FORTUNE which has been incorporated into Japan`s popular group of SHICHI FUKU JIN- the Seven Lucky Gods. His easilly recognizeable form: little beard and/or moustache, big belly, courtiers cap, and most importantly- fishing rod in one hand and big fish in the other, shows that originally he was a sort of patron saint of fisherman. Later however, with the emergence of a merchant class during the Muromachi Period, Ebisu was adopted as the guardian of the market place, and god of MONEY MAKING ( and you might know his image from the label of the beer named after him). Farmers in various parts of Japan also adopted him as a god of good harvests and prosperity. The connection of Ebisu to the 10th month is this. Traditionally, the Japanese believed that at this time of year, when the rice harvest has been completed, that all the myriad Gods of Japan ( Yaoyorozu), leave their usual abodes, and head out to the Izumo Grand Shrine ( in what is now Shimane Prefecture) where they all gather to discuss match-making for any Japanese who might be in need of a partner. 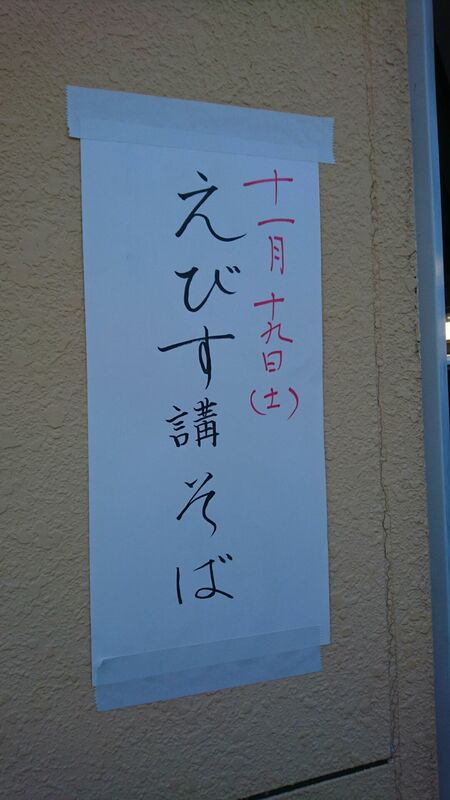 This month (in the old calendar) was called the No-Gods-Month (Kannazuki- 神無月). And with the Gods away, who is there to hold up the fort and protect the residents of the realm- you guessed it- EBISU, who probably got stuck with that job. The Ebisu -Ko, originally consisted of making offerings to the lonely god ( a consolation of sorts), but as commercial culture developed so did the festivities. In late November, after the farmers had sold all their rice, they would come into town ( towns just like Hojo) for their ONCE A YEAR SHOPPING SPREES, purchasing all the clothes, fertilizers etc, that they would need until the next harvest would be finished. The Ebisu Ko was the day that these farmers waited for to do all this shopping, and the merchants offered special prices. Not only that, they also would close earlier than usual and arrange for huge feasts for their good customers and staff. On that day the merchants ( and farmers as well) would also make offerings to Ebisu ( which varied from place to place) and also carried out rituals ( which varied in the same way) which would guarrantee success in business– immersing their wallets in buckets of rice, pretending to sell their wares for exhorbitant prices, etc. Unfortunately for Ebisu, however, things just don`t operate the way they used to, and November is no longer a time for farmers to shop till they drop. The day has lost its significance. Asking everyone I met today in Tsukuba if they or their relatives celebrated the Ebisu-Ko, I hardly met anyone who had even heard of it. One young mother from Nasu in Tochigi Prefecture did tell me that her Grandparents ( farmers) had a very old statue of Ebisu to which they made offerings to every late autumn. But as for Tsukuba, besides the simple hand-printed posters announcing the coming of the event this year ( Did anyone buy soba for the occassion? I will try to find out), the day of the Ebisu-Ko has come and gone without hardly anyone knowing and with bearly a trace. As I have stated above there are variations in how Ebisu is celebrated. One intersting difference in that between the Kanto Area ( around Tokyo) and Osaka ( in western Japan). In Osaka, which is still considered a MERCHANT`S TOWN, the celebration of Ebisu has remained very important, though it takes place on a different day- especially the 10th day of the 1st month ( as well as the 10th day of the 10th month). Since the 10th of any month is called TO-KA in Japanese, the special Ebisu Days in Western Japan are called TO-KA Ebisu. In Eastern Japan, Ebisu is celebrated on the 20th of the 10th and the 1st months. Depending on the town, one of these days ( either winter or autumn), is the Farmers` Ebisu, and the other the Merchants Ebisu. And since the 20th of any month is HATSUKA in Japanese, in the region around Tokyo, special Ebisu Days are called HATSUKA EBISU. The other problem is this. There are two possible ways of determining these dates- by the Gregorian Calendar ( which is the calendar that the Japanese have usued since 1872), or by the old calendar ( kyu-reki), which is sometimes used for traditional events ( and it is with this calendar that the events fall within the season that they are supposed to, while with the new calendar it is about 1 month too early in terms of flowers and fruits associated with these events). So in Hojo, the sign announced the coming of the Ebisu-Ko according to the old calendar. In the Kansai Area, however, the NEW calendar is most commonly used, and the biggest celebrations (and bargain sales) are held each year on January 10th. The best place to get an idea of just how and when the worship of a deity called Ebisu ( or EBE-SAN, as he is called in the Kansai Area) is at the Nishinoya Shrine ( 西宮神社)- the MAIN Ebisu Shrine in Japan ( and there are more than 3,000 of these!). In Kansai, it is affectionately known as NISHINOMIYA NO EBE-SAN. The first records of Ebisu having been worshipped date back to the Heian Period, but because by that time, the shrine seems to already have had a large and fervant following, it is natural to assume that the origins of this deity go back much further. Since the word EBISU can have the meaning of SOMETHING WASHED UP ON THE BEACH, this is probably exactly what happened- something strange ( or amazing) was discovered on the shore and subsequently became the object of worship. Good luck must have come to those who did pay devotions to the shrine that had been set up, and the word probably spread- that this shrine brought good fortune. It is also interesting to note that the word EBISU can also mean foreigner or barbarian ( or the indigenous people of Japan`s North-East, the Emishi), and thus could mean that the what was washed up on shore was a ship with foreigners- BEARING EXOTIC GOODS. It is also possible that the name EBISU simply derived from the idea that good things came from over the sea. Anyway, the Yamato Court promoted an interesting idea to connect this popular god with mainstream Japanese Mythology. According to the Kojiki ( Japan`s oldest extant text) HIRUKO, the first child of Izanagi and Izanami ( the couple who would go on to give birth to the Gods) was terribly deformed at birth and cast off into the sea. Nothing is written of what became of this unfortunate child. Since Ebisu`s origins are in the sea, scholars of the court asserted that it must be Hiruko. They created a story, saying that Hiruko washed up ashore in what is today`s Hyogo Prefecture and grew up to be EBISU SABURO DONO. and then the Deity Ebisu- Patron Saint of Fishermen, and guardian of marine Safety, and the sea trade. 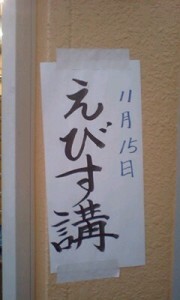 A few years ago I took this picture – Hojo`s Ebisu koh was held on November 15th. Earliest Snowfall in More Than 50 Years Blankets Tsukuba! I found this blog around my arrival time in Japan last September 2015 but this post tickled me to leave a trace here. So that explains the 無 in kannazuki! Just started learning Japanese when I arrived, bought a Japanese (Gregorian) calendar and wondering why November has its odd name.